Marlton, NJ – Samaritan Healthcare & Hospice’s Celebration of Life committee members are busy preparing for the organization’s annual event on Saturday, February 10, 2018 at the Crowne Plaza in Cherry Hill. This event, sponsored again by Holman Automotive, was attended by more than 390 guests last year. It features dinner, live music, dancing, a silent auction, and a Delightful Dining raffle where two winners will each gain 12 $100 gift certificates to some of the region’s best restaurants and restaurant groups. Celebration of Life gala proceeds support the gift of hospice, palliative, and grief support services for all Samaritan patients and families – including the more than 400 veterans Samaritan serves each year. For information on sponsorships, gala and Delightful Dining raffle tickets, visit samaritannj.org or call Julie Weitzman at 856-552-3239. Samaritan is extending a special event rate to active military personnel and veterans, and young professionals age 35 and under. 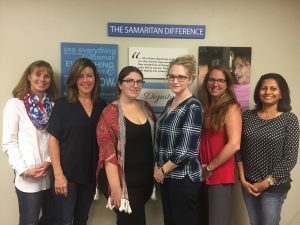 Left to Right: Committee Member Mary Depew, Theme Chair Kathy Dugan, Raffle Chair Theresa Savage, Gala Committee Chair Sarah Adelman, Auction Chair Lindsey Watson-McCarthy, and Committee Member Nandini Natrajan at a recent planning meeting at the offices of Samaritan Healthcare & Hospice in Marlton.